This is the Hoffman 5E3 "Deluxe" board kit. This board is a good "roll your own" if you can build the cabinet, chassis, etc, or a good drop in for an existing cabinet. The board comes "stuffed" with all components soldered in place via the standard "Hoffman" turret lugs. The board comes in two versions from TheAirtightGarage, standard and bare. 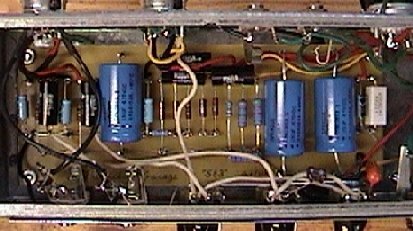 The standard version comes with all of the "stock" parts: carbon composition signal resistors, precision flameproof resistors in the power section, and choice capacitors in the signal chaing (Sprague, Polys, Mallory). F&T, TAD, or other high quality electrolytics are used in the cathode bypass. The bare board is just that, the board, with all turrets installed, and silver buss wire between turrets. Please note that pictured is TheAirtightGarage's personal listening board that has had the components changed (resistors, capacitors, etc) countless times. The board you receive would be "cleaner" in terms of component soldering and placement. Chaissis, knobs, transformers, cabinet, speakers, tube sockets, tubes, switches, and "everything else" not included. You will receive the board and associated parts as per the above list. This 5E3 board comes with the power supply capacitors on the board itself. Please specify when ordering if you want the stock resistor in the power supply, or if you intend to replace it with a choke. TheAirtightGarage recommends the choke for a "fuller" sound. The blank board does come with turrets and buss wire attached. If you order it note that you will need everything else including screws and standoffs.